It took me a couple of minutes to fully realize what Mitch was doing. I'd seen him tie on a heavy bass jig and adjust the trailer on the back of its hook, but then I had focused on my own fishing and stopped paying attention. Instead of slowly working the reel, raising the rod tip with a lift and bounce through the heavy grass, he was simply casting out and retrieving the jig quickly, just under the surface. The bait threw wake like a toy motor boat. Then another wave rose up suddenly, and a behemoth bass erupted on the jig. It seemed to good to be true, almost like a common bass myth. I stopped to watch. Mitch latched onto a true six-pounder. With the added weight from the grass that hung on his line, his cue stick of a rod was bending under a lot of pressure. But the bass was hooked firmly in the side of its jaw, and with braided line making the connection, Mitch was able to pull the fish to the boat, grass and all. After he released the big sow, I took a closer look at his bait. It was a heavy bass jig, but instead of the bulbous look of most jig heads, this one had slightly flared sides, a little like airplane wings connected to a fuselage. This style of jumbo jig for summer lakers, known as the Swim N' Jig, has recently gone into production and, along with a number of other manufacturers' jigs, has helped to spawn a technique that seems to be the antithesis of how a traditional jig works. Ask most bass anglers how a skirted jig should be fished, and they'll say that it's meant to be flipped or pitched then slowly bounced and crawled along bottom or through heavy cover. The answer you won't get, unless the angler is up on the latest developments, is that a heavy jig may be cast from a long way and then buzzed across or just under the surface. Basically, the lure is fished more like a buzz bait than a fat jig. Short, pinpoint casts to work tightly around submerged wood and small openings in thick grass, the angler looks for the thickest, nastiest mat of weeds along the shore line or across a mid lake flat, and then he throws a jig out as far as possible into the slop. Rather than let the jig sink, the angler keeps the rod tip high and begins a steady retrieve. The aim is to make the bait slide over the mats, or just under the surface, depending on the density of the weeds. It shouldn't come as a surprise that a lure originally designed to work on bottom could also be extremely effective fished close to the surface. In a sense, the swimming jig retrieve is just a take off of the bucktail jig retrieve. Bucktails were originally meant to be fished slowly along the bottom, too, but many anglers, particularly in salt water, now retrieve them with a steady turn of the reel handle, usually twitching or jigging the rod tip. 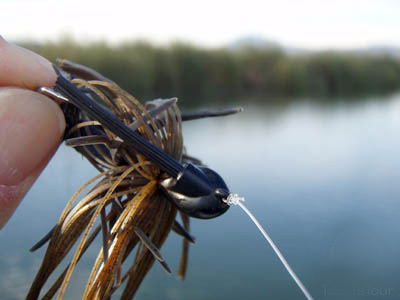 However, it is not a lure or a technique typically encountered in a bass boat and the jig used when swimming for bass is more in the style of what a bass angler is accustomed to using for heavy, bottom bouncing retrieve. Mitch's jig, manufactured by Booyah and Pradco fishing, has a flattened head, most other manufacturers only bevel the front face of the jig. Some bass anglers simply work standard jigs but with the swimming retrieve. 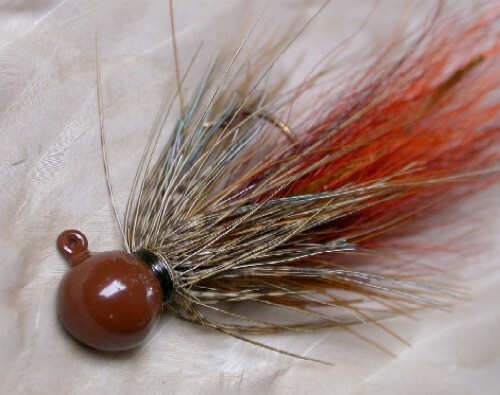 There are some prerequisites to swimming a jig. Top on the list is weeds and shallow water. For the most part, this is not an open-water tactic. Instead, you want thick surface-matted vegetation over no more than 3 to 5 feet of water. The technique even works in water knee-deep or less. The fat trailer on the back of the jig helps lift the bait during shallow retrieve. Grass that canopies the underwater world, such as milfoil and coontail, are particularly suited for this approach. But by varying the speed of the retrieve it is possible to work a swimming jig just as well across pad-type vegetation, especially spatterdock and water lilies. For the swimming jig to be truly effective, the bass must be hugging the mats. Fortunately, once the grass appears, the fish gravitate to such areas and stay there for extended periods of time. When trolling for bass in spawning season, bass build nests and, for a time, protect their eggs and fry in the shallows. A swimming jig can be deadly in this situation (but only if the area's conservation laws permit fishing for bass during spawning season). Spawning bass are notoriously picky, yet a jig with a trailer speeding over their heads apparently triggers an aggressive reaction, and they lash out at the intruder. After the spawn, when bass are simply looking for cover and food in the weeds, the technique stays just as deadly. The basic technique for swimming a jig is very easy. It's simply a fast retrieve over the surface. Yet, there are some variations. Some anglers recommend twitching the rod tip, sometimes jarring it, yet all the time bringing the bait forward. When crossing an opening in the weeds, you can let the bait drop slightly below the surface. By comparison, some anglers like to strafe the water like a jet fighter pilot. Casting and retrieving, skidding the bait over the grass with very little or not additional rod action. Move over as much grass as possible. Successive casts only need to be about a foot apart. With either technique, it is absolutely necessary to hold the rod tip high, somewhere between the 10 o'clock and noon positions. The aim is to keep as much of the line off the weeds as possible. A foot of line lying flat on the water in front of the lure is a couple of inches too many. The angler should strive to keep the rod high for as tight a connection with the lure as possible, without actually lifting it off the surface. The technique is remarkably snag-free. When using hollow body frogs and buzz baits, the common wisdom is that you must "feel the weight of the fish" before setting a hook, but when swimming a jig, the hook-set should be made immediately. There's no waiting to feel the weight before raring back. It's also recommended you use a rod suited to heavy flipping and pitching, so they can put a lot of muscle into the strike. Regular monofilament has too much stretch for this technique, which leaves anglers with two good choices: either fluorocarbon, which has less stretch, or braided line, which has no stretch. Choose based on your equipment and preference. Spring through fall, bass anglers need to try fishing the slop to catch the big fish. Swimming a jig over the weeds in this fashion reduces snags and makes the situation a lot less trying. The fact that it's also very effective makes it an easy call.